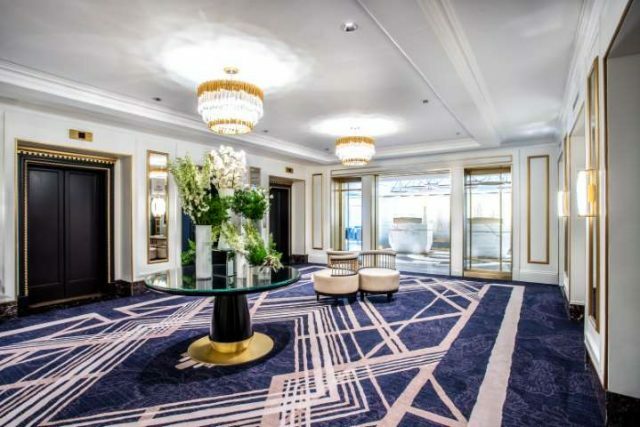 Fairmont Royal York, one of Canada’s most celebrated landmarks, today revealed its newly reimagined Fairmont Gold offering, the brand’s exclusive luxury “hotel within a hotel” experience within the property. Perched high above the city on the 12th through 18th floors of the hotel, with a private lounge featuring commanding views of the Toronto skyline, the new Fairmont Gold indulges discerning guests, from celebrities and heads of state, to business executives and leisure travelers, with the highest level of exceptional service for a memorable and personalized stay. 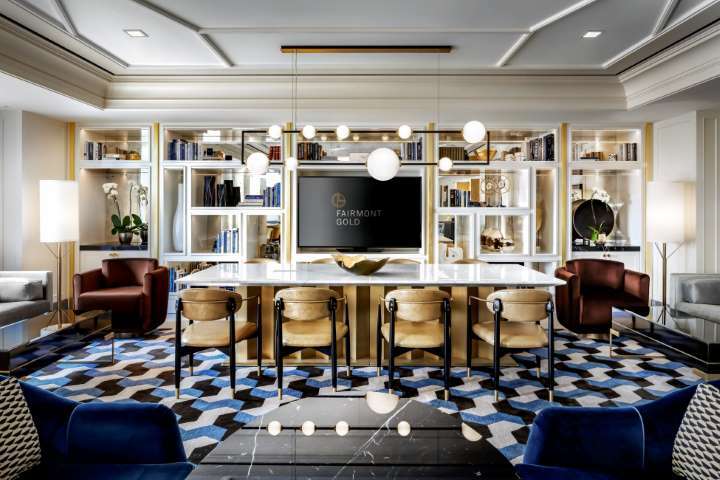 Fairmont Royal York commissioned Champalimaud Design, the award-winning firm and global tastemaker in hospitality interiors, to revitalize its Fairmont Gold and showcase a sophisticated, warm and welcoming atmosphere that evokes the hotel’s history through a modern lens. Along with an intimate private lounge, Champalimaud reimagined Fairmont Gold’s collection of 106 new elegantly appointed guestrooms, studio suites and one-bedroom suites. All guestrooms and suites feature expanded spaces, with both classic and modern details creating bold, visual statement inspired by the hotel’s original 1920’s Art Deco geometrics. Through signature furniture made in Canada and reflective fixtures such as marble countertops and statement headboards, each decorative accent highlights the hotel’s elegant legacy while representing a contemporary and residential feel. 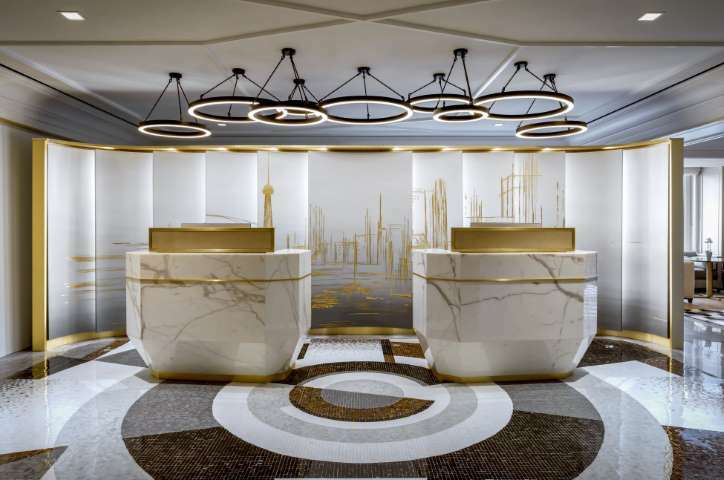 Private express elevators open up to the 18th floor Fairmont Gold Lounge where a stunning cityscape mural and bespoke hand-laid mosaic stone foyer welcome Fairmont Gold guests – referred to as ‘residents’ by the hotel team. The expansive lobby is complete with a private arrival experience and reveals panoramic views high above the city, providing guests with a sense of privacy and relaxation in their own exclusive enclave. Illuminating and reflective suspended fireplaces and an open work area with a library and curated book collection complete the design, creating a warm atmosphere that evokes the feeling and comfort of home. To pair the penthouse-style lobby lounge with fine culinary offerings, executive chef jW Foster was inspired by the history of Toronto’s most authentic neighbourhoods. With dishes representing the fabric of Toronto – its communities – the Fairmont Gold experience is highlighted through a selection of culinary assortments with various flavour profiles reflecting each identity. The all-day food and beverage experience in the lounge is complimentary and includes evening hors d’oeuvres, a premier honour bar with signature Fairmont Gold cocktails, spreads including the hotel’s award-winning rooftop honey, and organic cold-pressed juice blends. With service directed by internationally recognized and highly trained concierge experts from “Les Clefs d’Or” society, Fairmont Gold exemplifies the highest levels of personalized service that discerning travelers have come to expect from Fairmont Hotels & Resorts. Accessible via a text messaging service or dedicated call button, the devoted Fairmont Gold ambassador is available to assist with any special request. Whether securing reservations at the city’s hottest dining and entertainment venues or administrative services and itinerary development, the Fairmont Gold Concierge delivers an essential VIP Toronto experience that is memorable. Fairmont Gold’s refined taste is also showcased through its thoughtfully curated selection of artwork, chosen by Toronto firm, Tatar Art Project. The art embodies the sophistication of Toronto and is a visual narrative of the city. The check-in area has hand-painted wallpaper created by a boutique Italian studio that was inspired by Toronto’s inclusive cultures. Echoing the sublime elegance of a beautifully accented downtown Toronto residence, the scenes of the city were depicted in new, modern ways and nuances of the hotel’s historic elements appear throughout its style. From the spectacular custom-made mural of the city skyline in the Fairmont Gold lounge, to the exquisite composition of artwork in the suites and public spaces, the pieces provide a sense of comfort and warmth while capturing the essence of the destination. The first and only hotel in North America to provide an exclusive in-shower, whole-body spa experience, Fairmont Gold at Fairmont Royal York provides hotel guests the opportunity to relax with the calming scents of European wellness brand, SkinJay. The all-natural essential oils are made with ingredients such as thyme, eucalyptus and lavender, and are diffused through the showerhead for a relaxing journey through calming aromatherapy and aromachology methods. Fairmont Gold also provides guests with a dedicated sleep program to ensure a peaceful rest, complete with a dedicated pillow menu with options including vegan-friendly material, temperature regulated or calming lavender- infused pillows to suit all types of sleepers. A complete program is set to roll out in late 2019.